Successfully Added Large Touch Screen GPS Navigator Car DVD System (2-DIN) to your Shopping Cart. Large (7 inch) LCD touchscreen car DVD system with GPS and Bluetooth along with a built in analog TV tuner and radio receiver in a 2-DIN (100 mm) package. We've been very busy lately trying to meet the overwhelming demand for GPS car DVD players with quality and value. More choice is what you've been asking for and we're happy to oblige with another exceptional GPS enabled car DVD entertainment system. Supporting today's most popular GPS software packages with its Win CE 5.0 operating system, the CVSA-C08 helps you navigate the road in style. An extra long 5 meter magnetic GPS antennae rounds out the package making it the perfect road companion whether you're darting around in your BMW Mini-Cooper or cruising in your Cadillac Escalade. Note, the CVSA-C08 unit includes an SD card with evaluation only GPS map software - you will need to purchase a GPS software package that best covers your region of the world. This unit's extensive features read like a electronics checklist for today's most popular in-car components. Bluetooth? Yes. Large 7 inch LCD screen? You got it. Watch TV shows and movies? Of course. Listen to the radio? Check. Play video and audio files off an SD card or USB drive? Right, and since we're on the topic of secure digital cards, there are not one but two SD/MMC card slots: one for the GPS, the other for multimedia, which is the mark of a true GPS car DVD system and not a car DVD system with GPS features thrown in. 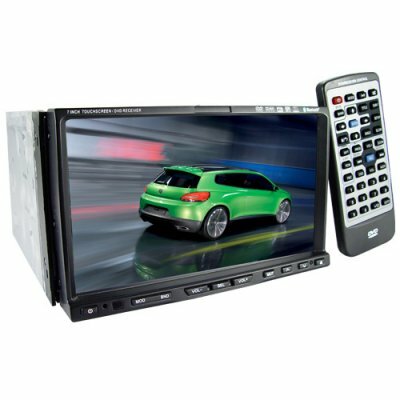 Built for the road for those with a passion for driving or just on the road a lot, this 2- DIN GPS car DVD system comes at a great wholesale price making it perfect for the resale market, VAR and OEM market, or simple personal/company use. As always, it is only available from your source for wholesale direct from China electronic products, Chinavasion. GPS navigation system (card slot plus OS) and Bluetooth for taking your driving seriously. The GPS navigation system OS is ready to run todays popular GPS software**.